Advertisement in the October 4, 1962 Eureka Springs Times-Echo newspaper. Tourists. You can’t live with them. You can’t live without them. My wife, Diane, recalls a disgruntled tourist years ago complaining about having driven all the way out to Dinosaur World/Land of Kong and the dinosaurs weren’t even alive. Another time a lady was impressed that Diane could read and write, considering that Arkansas didn’t have schools. Used to be, one of the recurring questions asked was where were all the “real” hillbillies? Do the tourists still ask that? I’ve heard stories of years ago how disappointed they’d be that the locals wore shoes and didn’t smoke corn cob pipes. I remember when my brother was a teenager and would visit from Washington, D.C., he’d borrow Uncle Arlie’s old Willys Jeep to drive around. He’d dress in overalls without shirt or shoes and go down Spring Street for the tourists to see a hillbilly. Fred Muller tells of being asked if the Christ of the Ozarks statue was manmade or a natural occurring formation. As jokes, kids used to tell gullible visitors that the Christ of the Ozarks statue had a revolving restaurant housed in Jesus’s head, or that you could take an elevator up to the top of the statue and look out Jesus’s eyes. Others told tourists that the statue would sometimes turn and wave. I’ve heard of frantic tourists rushing into the emergency room at the Eureka Springs Hospital because their child had a tick and threatening lawsuits over it. I remember being told by a tourist that they were tired of driving on the curvy, hilly roads and would I tell them how to get on the interstate. When I explained the distance to the nearest interstate, he argued that all towns had interstates and would I just tell him where it was. Tell me your story at steve@steveweems.com or P.O. Box 43 in Eureka Springs. For several years there was a Glenn Swedlun painting of Keels Creek for sale by an art dealer in West Virginia. I’d seen it on the Internet and it would pop up on eBay periodically. Several branches of my family have long had connections to the Keels Creek area, and my father particularly remembered idyllic childhood summers and weekends at the Wolfinbarger farm. It isn’t often I have the energy to covet something, but I coveted that painting. After a short career as a professional baseball player, Glenn Swedlun turned to art for his livelihood. He had been taught painting by his father, landscape artist Fred Swedlun. They eventually had shop space on Spring Street in which to show their work. I’ve been told the story that Glenn and Fred would ride buses out of Chicago looking for landscapes to paint. After a stop in Eureka Springs they decided that they’d found a lifetime’s worth of source material in the Ozarks. In the 1960s, Wayne Mote wrote in the Oklahoman Magazine that Glenn Swedlun was completing a mind-boggling 125 canvases a year. It was hard work. I’ve also been told that a favorite process of Glenn’s was to go out and tromp around in the hills until he found something that he wanted to paint. Then he would spend several hours looking the scene over, watching the light change, memorizing. He would return to his studio and paint the scene. When my wife was a little girl, Glenn Swedlun bought his gas at O’Connor’s Texaco and he would always give her a quarter. Later, when she won an elementary school art contest, he heard about it and gave her copies of his notes on various aspects of painting and drawing. By all accounts, Glenn Swedlun was a good guy. If the past were a state of matter, it would be solid. We may debate history based on evidence and wishful thinking, but it has already occurred and has a reliability that the liquid present doesn’t have. Take for instance the happenings of 1968 as reported in the Eureka Springs Times-Echo edition of April the 25th. Digby Walker resigned from the Planning Commission and Mayor Freeman appointed Arvle Bandy to fill the position. That sounds pretty solid to me. I can go on to speculate about why Digby Walker resigned. (He was getting up in years), which leads to thoughts of buying blue jeans at Walker Brothers. (I wish it had never closed). Continuing to read the newspaper spread before me, new signs were to be placed at the city dump warning that illegal dumping would incur fines of $5.00 to $10.00. Where was the city dump then? Perhaps where the city maintenance and recycling center are located now? Ordinance No. 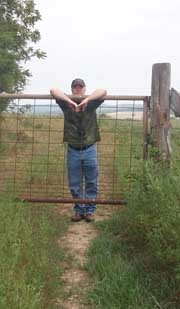 722 once again reared its ugly head as neighbors turned in neighbors for the keeping of livestock in the city limits. Letters were mailed out and the chief of police was made aware of the situation. The movie theater at 95 Spring Street would soon reopen under the management of John Maberry, brother of the late Cecil Maberry. It had been completely renovated and the name changed to the Gaslight Theatre. Mr. Maberry announced there would be a free show with free popcorn and free Pepsi on May 2nd. A front page story listed Randy Littrell, Tommy Helms and Ellen Bingaman [Summers], among others, as having made good grades at school. And so I end a short tour of history and a few of the thoughts it triggers. Don’t ask me to rely on my memory of the events of April 25, 1968. I was five days old. Jerry Dale Stoppel, stretched to his full-length beside the 24 lb. 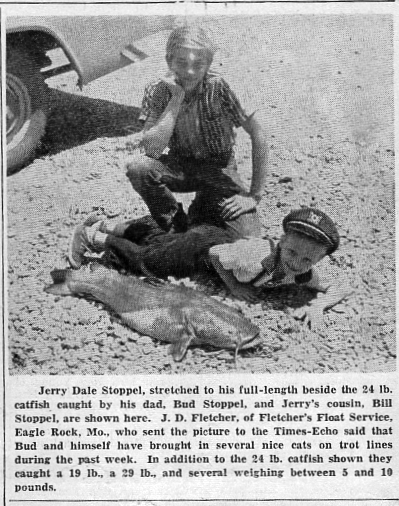 catfish caught by his dad, Bud Stoppel, and Jerry’s cousin, Bill Stoppel, are shown here. On the Berryville Public Square is a memorial to those of Carroll County who died in the wars of the 20th century. The names of the dead are organized by war and engraved on the monument. Fifty-two of the fifty-nine names listed died in World War II, while three died in World War I, one in Korea and three in Vietnam. While in the US Navy, my father served three consecutive tours to Vietnam on the destroyer the USS McKean. It spent time in the coastal waters off Vietnam, but also on the river deltas and up the rivers. Donnie Weems died December 24, 2011 at the age of 70 of health complications linked to Agent Orange exposure. Agent Orange was a defoliant manufactured by Monsanto and Dow Chemical and sprayed by aircraft in Vietnam to eliminate cover that could be used by enemy forces. My father was initially skeptical of his Agent Orange exposure, but it was his nature to be initially skeptical of everything. The Veterans Administration said that his contact with Agent Orange would have been during his time on land in Vietnam or on the rivers and river deltas. But the USS McKean would also float off the coast of North Vietnam to coordinate communications for downed pilots and the wind would blow the sprayed poisons out to sea, contaminating everything. My father described standing on the deck of the ship and the wind washing over him. The government admitted his extensive heart damage and blindness were directly related to the Vietnam War. 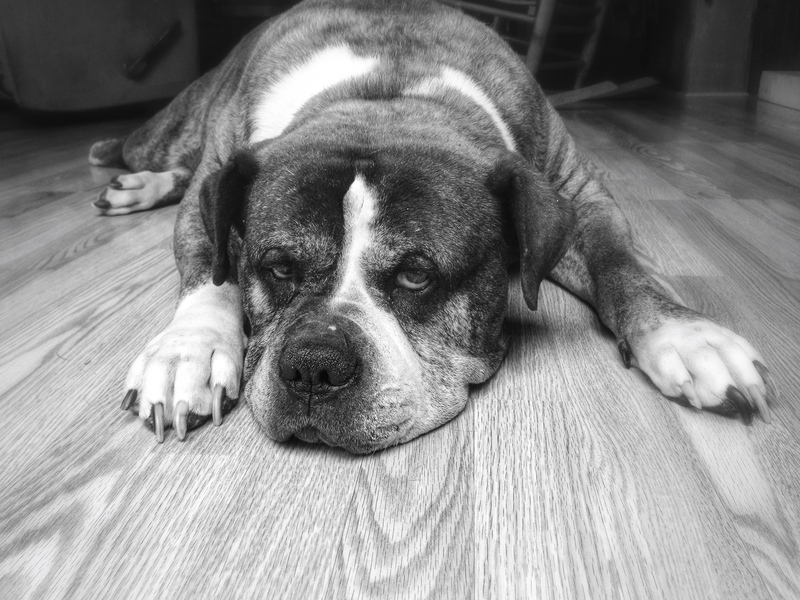 The Veterans Administration rated him as 540 percent disabled, as if that were possible. I do not recall him ever saying that he felt like he was in grave danger during Vietnam (not that he would have), but I’ve read online that his ship took fire (which he never mentioned.) However, the war apparently had a hand in killing him, though it was more than 40 years later. One day I walked into a local automotive place just as a man boldly declared, “I’ve eaten groundhog, but I’ve never tasted possum.” Now, maybe you hear that same sort of thing in a Boston muffler shop, but I’m guessing not. From the sound of the man, I’d say he was local. I do wish I had a better ear for regional accents. When I hear a tourist from Minnesota speak, I know they’re not from Mississippi, and I know the Mississippian isn’t from Maine, but I can get tripped up by about anyone else. Historically speaking, the Ozarks were isolated enough that certain words and speech patterns stayed in usage longer here than in other areas. My granny, Betty (Southerland) McCall was born near Rockhouse on the Kings River and would say things like, “I swan” or “pshaw,” words that some dictionaries label as archaic. On the other hand, I used to hear local older men exclaim, “Shoot fire!” or “Man alive!” and I hadn’t heard those expressions elsewhere until David Letterman said them on television one night. Isn’t Dave from Indianapolis? Maybe they aren’t Ozark expressions, after all. Maybe those expressions are more generational than regional. One thing is clear after speaking to people about the Ozark dialect, though. Locals seem to think it’s dying, or at the least has become diluted, perhaps with the proper American English we tend to hear on television and in most movies. I just know that having lived elsewhere at times, I’ve always enjoyed coming home and hearing the local speech patterns again. I love listening to my grandmother, Lola (Wolfinbarger) Weems, and my aunts because of the almost musical quality of their speech. It sounds very much like home. The mean dirt roads of the little hollow we live in may not be ruled by a proper street gang, but the air is. For many years, the sky over the hollow was the domain of a pair of hawks, regal and proud, but a coup by the crows has changed all of that. The rebellion was not immediate, but incremental. First, I saw a few brave crows challenging the hawks in flight, but as time passed, more and more of the crows joined in. Then a neighbor told me they witnessed the crows tormenting a downed hawk. Later, in the woods, I listened from a distance to the pitiful sounds of the remaining hawk as crows surrounded it and finished it off. The “meep, meep, meep” of the once powerful bird of prey became weaker and weaker. A group of crows is called a murder, and perhaps for good reason. Nature is not all happiness and party balloons. My nephew Brandon and I once stood high up on the ridge overlooking the Kings River Valley with his remote control game call. Brandon was very hands on when it came to the natural world and, though less than half my age, he taught me much more than I taught him. He set up his electronic gizmo and we retreated a distance. He had the little machine make the sounds of an injured crow. I thought this process would be hit and miss, but, no, Brandon guaranteed that there would be a response. He had no doubt. Within a couple of minutes, about 15 crows arrived looking for their injured comrade. A lookout was posted and the others called out and searched in vain. Then a big hawk swooped in and watched the proceedings from a distance in the top of a tall tree down the ridge. And then other smaller birds congregated, much like humans do when they have a chance to look at the aftermath of a automobile accident or a house fire. It was one of the most amazing things I’ve ever witnessed. All this reminds me that I keep meaning to check and see if the Carnegie Library has a DVD copy of Alfred Hitchcock’s The Birds.